In the golden age of Arctic exploration, there was only one “Captain Bob.” Deemed the greatest ice captain of the 20th century, Bob worked as a sealer, Arctic explorer, ice captain and scientist. In more than half a century at sea, he sought high adventure and fresh discoveries in some of the wildest, remotest corners of the world. 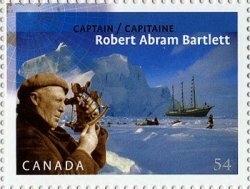 Robert Abram Bartlett was born in Brigus, Newfoundland, on August 15, 1875, into a family of renowned seal hunters and sailing masters. His mother hoped he would enter the ministry, but, alas, the sea was in his blood. From 1898 to 1909, Captain Bob accompanied renowned American explorer Robert E. Peary on three separate attempts to reach the North Pole. During the third voyage, he led the expedition to 87°48' N latitude — farther north than anyone had reached before him. For reaching this “farthest north”, Bartlett was awarded the Hubbard Medal by the National Geographic Society, one of the most prestigious recognitions in the world awarded for research, discovery and exploration (since 1906 it has been awarded only 34 times). Bartlett is also remembered and revered for his leadership in the 1914 Karluk disaster. The Canadian Arctic Expedition was led by the Arctic explorer Vilhjamur Stefansson and Bartlett was captain of the expedition vessel Karluk. The ship became stuck in the ice and was eventually crushed. They were marooned for months with Bartlett trying to move the isolated party across the Arctic Ocean. Finally, Bartlett and one Inuk crew member made an incredible 700 mile trek in 37 days which took them down the coast of Siberia to Alaska where he found vessels to rescue the stranded members of the expedition. In 1968, a Canadian Coast Guard history referred to Bartlett’s role in this episode as “the finest feat of leadership in Canadian marine history.”A detailed account of the Karluk story is found in the 2000 bestseller The Ice Master by Jennifer Niven. In 1926 Bartlett purchased the Effie M. Morrissey and began a 20 year period of expeditions taking scientists and researchers into the Far North. Bartlett and the Morrissey went north each year from 1926 to 1945. These voyages were, on average, 10,000 miles. Bartlett was conducting work for many institutions in the United States including the Smithsonian, the American Museum of Natural History, National Geographic Society, New York Botanical Gardens, Chicago Zoological Society, Philadelphia Academy of Natural Sciences and others. Scientists wanting to go to the Far North considered it a rite of passage to go there with Bartlett. Icy blues and snowy whites make a fitting backdrop for the commemorative stamp issued to mark the 100th anniversary of Captain Bob’s legendary attempt to reach to the North Pole. The issue features Bartlett holding a sextant, an instrument used to measure latitude and longitude at sea. “We chose the photo because it represents the navigational expertise for which he was renowned,” explains designer Karen Smith. The top-left corner of the stamp features an outline of the globe from the North Pole downward, which bleeds onto the stamp’s frame. The background features an image of the Roosevelt (the ship that Bartlett both skippered and captained on the Peary Polar Expeditions) superimposed onto a recent photograph of the Canadian Arctic. Smith adds, “We opted for a newer photo because the vivid colours capture the cool, harsh conditions of the region.” Scattered between the on-looking Captain and his ship are the Inuit people whose knowledge of the region ensured the survival of the explorers in the harsh Arctic climate. A total of 1,750,000 stamps have been printed, and 19,000 First Day Covers. Embracing the traditions of his mariner ancestors, Captain Bob Bartlett spent a lifetime devoted to unmasking the mystery of the Far North. He brought a new land to the world. His contribution to our understanding of the North is invaluable and he leaves a legacy as one of our time’s great discoverers.